My brother had an outdoor fireplace added to his backyard when he had it landscaped several years ago and we enjoyed it frequently. 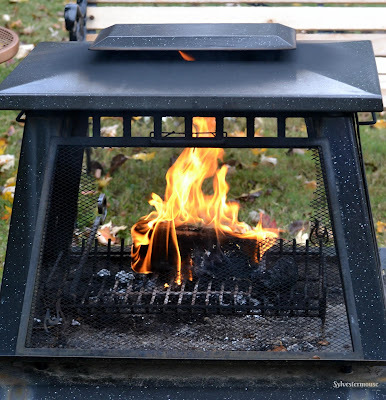 My son's neighbor also has one and these Duraflame firelogs are the perfect solution for enjoying a quick and easy fire. Good suggestions, Sylvestermouse. I had forgotten about using Duraflame firelogs! I used them years ago. We do have a little firepit on the deck that these would be perfect for! Thanks for the reminder! While I don't have a fireplace anymore or an outdoor fire pit, I have used Duraflame logs before and they are great. Just one note, do not use them in a wood burning stove! The flames get too hot for the metal chimneys to handle. Outdoors or in an open fire place, they are great! Fond memories of the duraflame logs! Time for a reboot! Cynthia, before we had a gas fireplace, we used these logs quite frequently. I have to agree they work very well. It was our go to item to get our fireplace started, or to use when were short on wood.